Travel with Kevin and Ruth! : Busy day with some wildlife sightings! It was fairly busy there at 7:30am, but the guy came right over to help me out. I saw the propane price on the pump, at $0.91 per litre (about $2.65 USD per gallon). Normally, propane is well over $1.00 per litre although the price varies widely and it pays if you can shop around. He filled us up, and gave me a slip to go inside to pay. The girl inside rang it up, and it was a couple of dollars more than the pump had said it was. I assumed maybe they add tax after the fact, and didn't think much of it. Back outside, I looked at the receipt and it didn't have any extra taxes, simply saying that the price per litre was $0.98. So now, I thought she made a mistake and I went back inside and pointed out the difference. "Oh", she says. "They just leave the price at the pump at $0.91 no matter what the price is. Right now, the price is $0.98. I don't know why they do that. Here's a number you can call to ask", As she points to the top of the receipt. It was only $1.75 or so difference, so I wasn't going to argue with her. But it makes no sense to me. Advertise a price at the pump, and then charge a higher price after you've already filled up when you go inside to pay? Even at $0.98, it was still a decent price so I didn't bother to follow up. Strange business practice though. We carried on through town and found a church to park beside while we had some breakfast and got on the internet. The Catholic Church in Ste. Anne, Manitoba. Fortunately, our side of the road was already freshly paved for quite a bit of it. But, we did have a little of this to deal with as well. We carried on to the summer resort town of Falcon Lake just before the Ontario border. This is where the northern lake district starts and the scenery is now definitely not in the prairies. Filled up with gas one more time before Ontario even though it only took $60 worth. Gas is more than $0.10 a litre ($0.40 a gallon) more expensive in Ontario, so better to top it off with the cheaper stuff. We stopped and went for a walk at Falcon Lake. It's a nice beach and I bet the place is a zoo on a beautiful summer weekend. Ruth, on the beach at Falcon Lake, Manitoba. Out for a walk on the Marsh Trail. Or is it some kind of cockroach?? Back on the road, it was only a short distance to the Ontario border. Ontario is a BIG province. Americans think that Texas is big. Ontario is bigger. It would take 22 hours of nonstop driving to make it through Ontario from west to east. Which means that it's pretty much going to take us a week! We stopped for lunch in the town of Kenora, then carried on. Ruth spotted a bald eagle sitting in a tree at one point, but by the time she pointed it out there was no point in stopping. I would have had to walk back to try and get a photo and then he probably would have flown off anyhow. 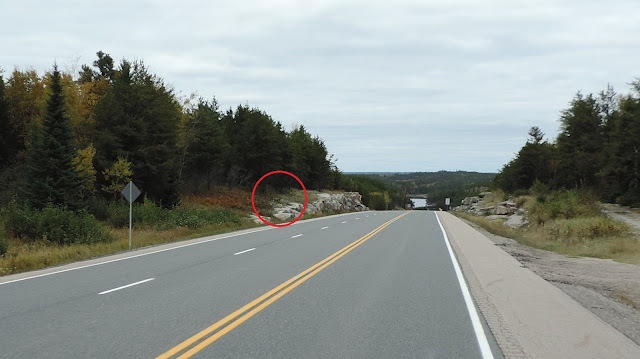 We were driving along, when we both saw an animal run across the highway in front of us. It took a second to clue in as to what it was...at first I thought it was a dog of some kind, but knew that it wasn't. It was a big cat! Yep, that's the best we could do! You can click on the photo to enlarge it, but it won't do you much good. Sorry. Despite the poor photo, that was very cool. 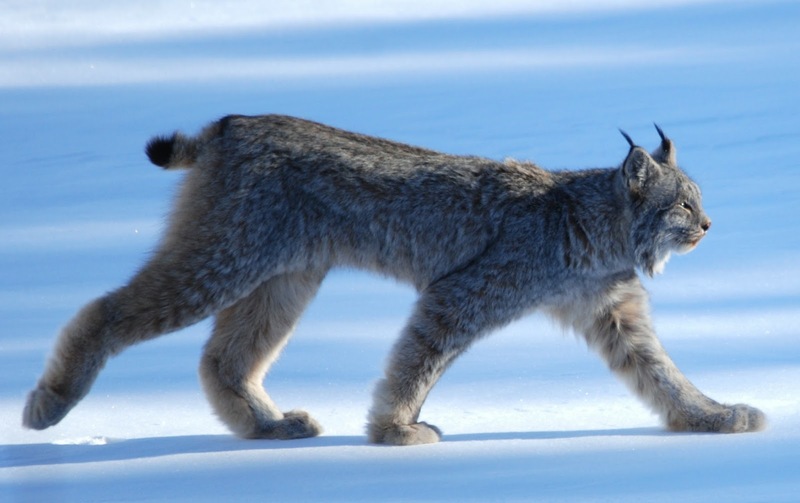 Canada's three large cats (mountain lion, lynx, and bobcat) don't show themselves to humans very often out in the wild. Further on, we spotted another bald eagle, and this time Ruth insisted I stop and try and get a photo. And I'm glad she did! I pulled over and walked back to where he was sitting high on top of a tree. I took one photo, and then as I pressed the shutter to take the second photo, he took off in flight! Both photos turned out really well. I took a third one too, but it was blurry. How about that mean look on his face! At the town of Vermilion Bay, Ontario they have a small airport landing strip just north of town on the way to Blue Lake Provincial Park. We had boondocked there overnight when we were heading west though this area 9 years ago! So we headed right to that same spot. But we passed by it and went to Blue Lake Provincial Park to go for a walk first. The park itself is closed, and the gates were locked but there's nothing stopping you from walking in. At Blue Lake Provincial Park. Never seen so many different types of mushrooms! After our walk, we backtracked to the Vermillion Bay airport and parked up for the night. Exactly the same place we parked almost nine years ago! And, in the same spot nine years ago! Yesterday's drive, 301 kms (187 miles). And in Canada, the Mega Blocks set is on at a good price, today only. Good for ages 1-5. My grandparents (fathers side) are buried at that church. Never met them. They had passed by the time my Dad was 14! We would have said hi to them, if we had known that is where they were buried. It is very pretty there so I am sure they are happy with their final resting spot. Nice eagle shots. When we are going from point A to B we drive 7 - 8 hours per day so it wold only take us three days. I would rather get to where I was going and spend more quality time there than meander along the way. Eveyone does things differently. Thanks Contessa! Yes, it is good that everyone is different. We have a very hard time traveling that much in a day, plus for us the trip isn't just about the destination but all the little hidden gems along the way and enjoying every moment and place as we travel along. A nice day of travel. That area of Ontario sure is pretty. I've spent many hours on Northern Ontario back roads and have never seen a lynx. Well it certainly was a first for us, guess we just got lucky. Haven't seen any moose or bear though! Lots and lots of lakes up this way! The fisherman love it here. Hopefully we will see more wildlife in the next week or so. I have been through there quite a few rimes years ago love the scenery. Propane here is southwest Ontario we have been paying .52 cents a litre, sure can't complain about that, Enjoy more travels. Do you have any problems filling your tank, or do you have a sticker that says it has been inspected? We have the original tank still and I believe by law in Ontario if we want it filled we have to have it inspected! Unless of course we find someone who either doesn't care or doesn't know. I had that same idea but I checked last year and if the tank is permanently installed in a chassis, inspection is not required. I was looking for someone who would inspect it and that's what I found on an Ont Gov website. See now that makes sense. But when they made all the new propane rules in Ontario back in 2010, I think it was...there was an awfully lot of confusion. Hopefully they've straightened things out. Thank you John! By the way from reading about them, they give a very nasty bite that is excruciatingly painful, and one of the worst inflicted by any insect but has no medical significance. Saw many bald eagles when we were near Comox, B.C. Nice! We never thought that we would have been lucky enough to have seen two on the very same day. I was really kicking myself when I didn't make Kevin stop for the first one so I was in heaven when I saw the second one and I made him stop because I didn't figure we would be lucky enough to get a third chance. Beautiful area and pictures! I'll bet it was exciting to see the Lynx! Yes, we were very excited! Wish we could have had a chance to have gotten a better picture though. I have never heard of not changing the pumps to reflect the correct price. That is so strange. A lynx is one of the most beautiful animals....IMHO. It was a great day! Couldn't have ask for much better, other than the problem with the propane price but even that wasn't a bad price so Kevin didn't push the issue. I know the looks on your face and I bet I would have cracked up when the clerk said, "they always leave the price that way". The Eagle shot is incredible! Truly, you should enter that in a pay to win contest. I'm pretty sure Kevin was just shaking his head when the clerk said that! Thanks Chris, it is a great shot but we have seen better when it comes to photo contests! Gorgeous Bald Eagle photos! Wish we could get one like that! Looks like beautiful drive, thanks for the GPS co-ordinates..haha Enjoy your trip and travel safe. Safe travels to you both as well. Enjoy your time with the family. You two in sweats and jackets already - wow! Great 'shroom pics and that posing-eagle shot is terrific. Yup, we agree, Ontario is HUGE!